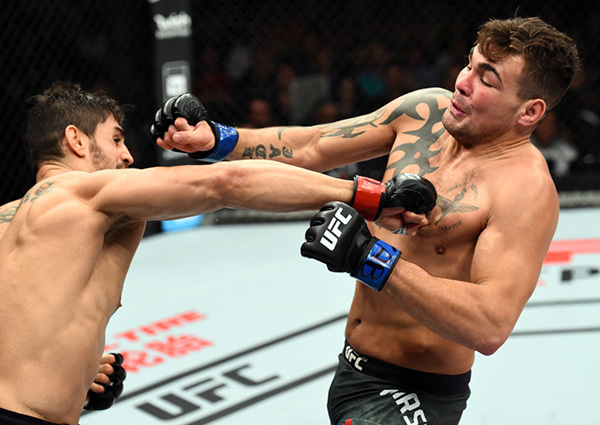 Stepping in on short notice to replace the injured Luan Chagas, welterweight up and comer Vicente Luque made the most of his opportunity at Ginasio do Ibirapuera in Sao Paulo, handing Niko Price the first loss of his pro career via second-round submission. With the win, Brasilia’s Luque moves to 12-6-1; Cape Coral’s Price falls to 10-1 with 1 NC. Keeping it standing for the first five minutes, Luque and Price each got their shots in during a fast-paced round, but Luque landed the harder blows, allowing him to edge the frame. Luque continued to surge ahead in round two, and with a little over a minute remaining, he hurt Price with a right hand then dropped him with a left. The Floridian survived the initial follow-up barrage, but Luque then sunk in a D’Arce choke, and the tap followed at the 4:08 mark. With the Brazilian fans cheering him on, the ground game of Paraiba’s Antonio Carlos Junior proved to be too much for Jack Marshman, as he tore through the Wales native en route to a first-round submission victory in middleweight action. Carlos chased after Marshman to kick off the bout, and after scoring with some hard punches, he got the Welshman to the mat 90 seconds in. Marshman’s defense was solid for a spell, but Carlos ultimately got into the mount position and then took his foe’s back. The tap out to a rear naked choke followed moments later at the 4:30 mark. With the win, his fourth straight, Carlos Junior moves to 10-2 with 1 NC; Marshman falls to 22-7. Lightweight prospect Jared Gordon scored the biggest win of his career, taking a unanimous decision victory over Rio de Janeiro’s Hacran Dias. Gordon (14-1) pressed the action throughout the first round, and while he took some solid counters and was bloodied by Dias, the New Yorker’s aggression served him well in the opening five minutes. Dias (23-6-1) got the bout to the mat early in round two, but Gordon was back to his feet immediately, and it was back to pressure and throwing punches at his tiring foe. With two minutes left, Gordon scored his own takedown, and now he began unloading with strikes from the top position. Dias had little response for Gordon, who battered him until the horn intervened. 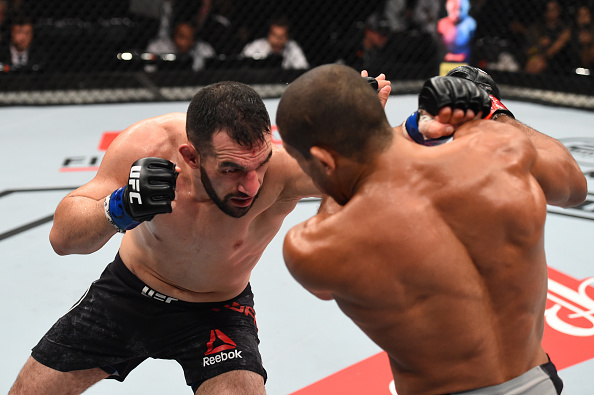 Gordon had another dominant frame in the third, and luckily there was no controversy, as referee Fernando Portella appeared to move in to stop the fight as Gordon pounded away, only to change his mind, which allowed Dias some daylight to attempt an armbar in the closing seconds. The clock ran out, though, allowing Gordon to get a hard-fought win by scores of 29-26, 29-27 and 30-26. Elizeu Zaleski Dos Santos maintained his reputation as one of the welterweight division’s top action heroes in prelim action, and he had a more than willing dance partner in Max Griffin, with both 170-pounders putting on an exciting back-and-forth scrap before Dos Santos emerged with a three-round unanimous decision victory. After a wild start, the fighters briefly settled into a more manageable pace, with Dos Santos taking an early lead behind a solid jab that cut Griffin under the right eye. Griffin was undeterred, and with a little over two minutes remaining, he scored a knockdown with a right hand. Dos Santos quickly recovered, and with a minute left, it was the Brazilian’s turn, and he hurt Griffin and had him wobbling around the Octagon. Remarkably, Griffin made it out of the round, and after a look from the doctor, he was cleared to continue. A slow start to round two followed for Griffin, but two minutes in, he was able to score a flash knockdown of Dos Santos, who quickly rose and resumed his standup attack. Griffin wasn’t going anywhere, though, and the two settled in for the long haul, even though each punch thrown was designed to end matters. Midway through the final round, Dos Santos appeared to be on the verge of a knockout as he drilled Griffin with a hard right hand, but the Californian shook off the blows once more and it was off to the scorecards, which read 29-28 twice and 29-27 for Parana’s Dos Santos, now 18-5. Sacramento’s Griffin falls to 13-4. In a clash of unbeaten flyweights, Brazil’s Deiveson Figueiredo left with his “0” intact, as he scored a split decision victory over Jarred Brooks. Brooks drew first blood with a slam to the mat in the second minute of round one, and his subsequent ground-and-pound attack drew boos from the Brazilian fans. Brooks didn’t stray from his plan, but Figueiredo was able to fight his way back to his feet soon enough. Another slam followed by Brooks with a minute left, though, and he kept his foe grounded for the rest of the frame. Figueiredo began to get on the scoreboard in round two thanks to a pair of guillotine choke attempts, but those were evened out by Brooks’ escapes and ground control. A third takedown by Brooks was nullified when referee Mario Yamasaki restarted the action and warned the American for a shorts grab, and the last takedown of the round was scored by the Brazilian. The third began like the second did, with a Brooks takedown and a Figueiredo guillotine attempt. 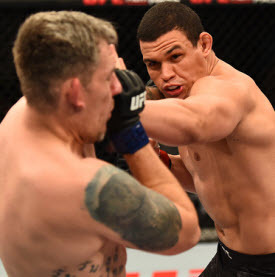 And while the takedowns continued from Brooks, he wasn’t able to do anything with them, and as the round progressed, Figueiredo began to get his range with his strikes. And while he wasn’t able to get Brooks out of there, the Para native did get the win via scores of 29-28 twice and 27-30. With the victory, Figueiredo improves to 13-0; Brooks falls to 13-1. 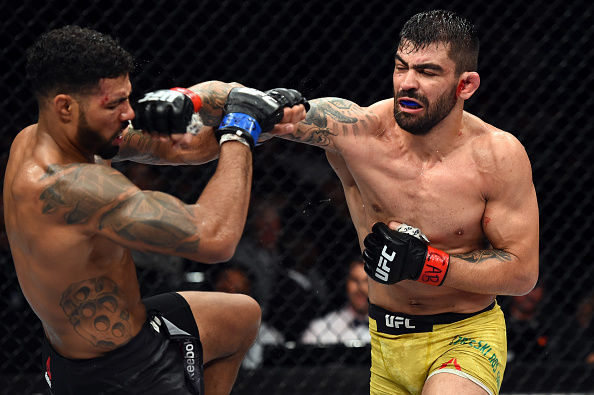 Brazilian heavyweight prospect Marcelo Golm impressed in his UFC debut as he kept his first-round finishing streak going with a submission of Christian Colombo. Clearly seeking a knockout, Golm rattled Colombo with several lefts and rights in the opening minute, and after scoring a takedown, he kept the punishment coming on the mat. Soon, Colombo was bloodied, and a rear naked choke followed, forcing the Danish heavyweight to tap out. The official time was 2:08 of round one. With the win, Pitangueiras’ Golm improves to 6-0; Colombo falls to 8-3-1.